HO! HO! HO! Merrrry Christmas friends! I’m blasting Christmas music on repeat, my living room is decorated, the trees in my kid’s rooms are up (but not yet decorated), I’ve already burnt through one holiday candle, I’ve refilled my candy cane holder after devouring the first two dozen…I am just feeling the holiday spirit & it is the absolute best guys!! 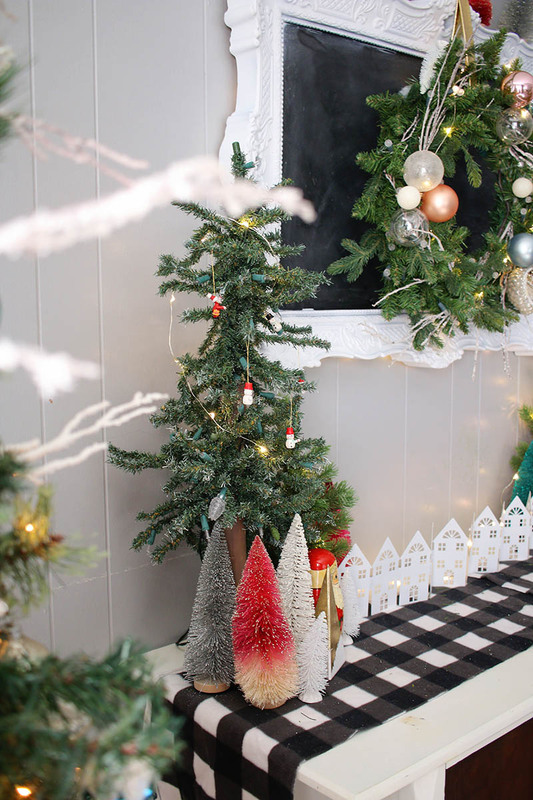 In this post I’m sharing my living room holiday decor with a emphasize on what is thrifted…which I realized was quite a bit when pulling it apart for this post. Ok…first, that console? Thrifted. $15. So let me share with you some of my thrift store home decor for the holidays. In the above picture so much is thrifted! I guess when you thrift as much as I do, you sort of forget just how much it thrifted throughout the years. The giant frame was a Goodwill thrift store find that I painted from an awful faux gold…not a regal gold but a “man that’s plastic” gold! 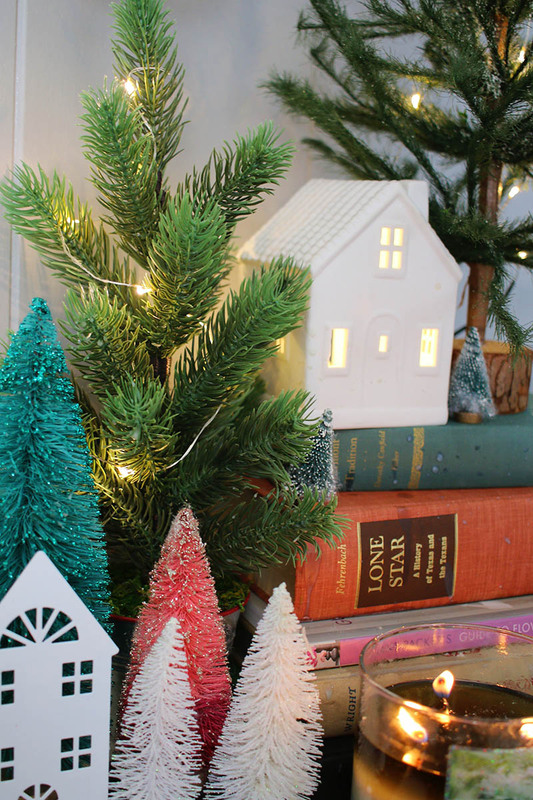 The two tallest trees are family thrift store finds along with the tiny wooden ornaments, a few vintage bottle brush trees, the wooden Santa & silver candy cane holder (it’s actually a sugar jar). Oh & that wreath? It took some fluffing, addition of picks & ornaments to look spiffy because it was in a sad, squished state when I found it at a goodwill thrift store. I love using books I’ve found through my thrift store trips to help add height & interest to areas. If I would have just sat that sweet Target dollar spot house at the base level it would have become lost in the chaos. But instead it sits on a hill of thrift store books overlooking the trees. By the way, excuse the wax that splattered after dropping a bottle brush tree in it LOL Just keeping it real here. My garland is a mixture of a bunch of randoms to make it full, don’t ever think that one garland will look like the magazines, they are filled with picks, ornaments & they are double/tripled up. Mine is two garlands plus picks from Balsam Hill (they make the BEST picks). A word about Balsam Hill’s picks..they look pricey at first glance but here’s the thing…they come in pack of 12 usually & are HUGE. The quality is much better than the ones you’ll usually find in home decor stores or Target but the price is very much the same. 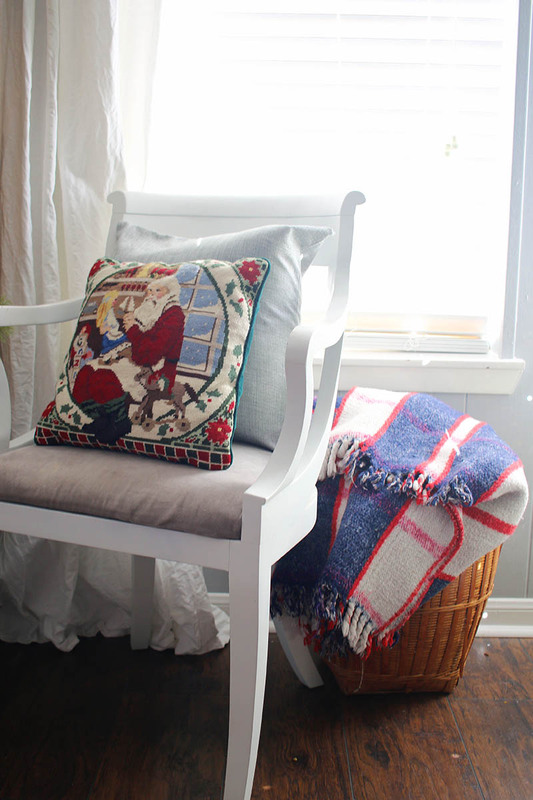 Both needlepoint pillows, chairs (that I gave a makeover), the blanket in basket & basket are all Goodwill thrift store home decor finds. Beautiful Christmas decor, love the pillows! 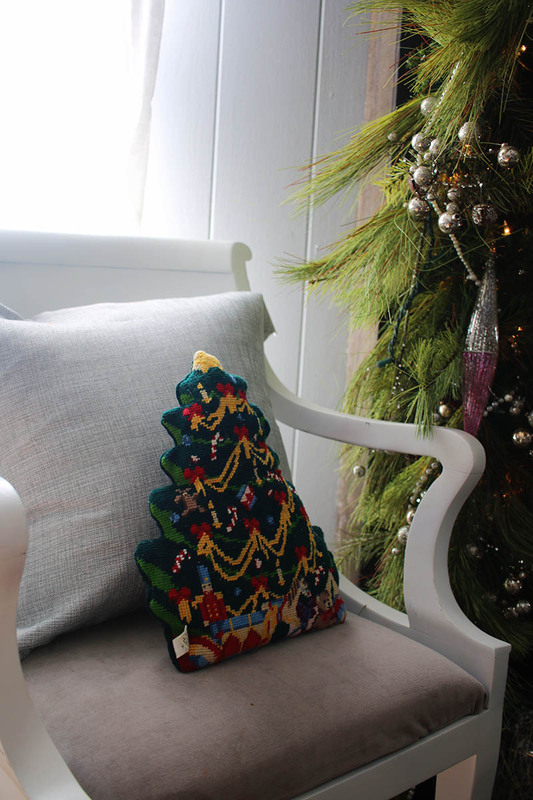 I love it all bit that Christmas tree pillow is just awesome. Balsam Hill has beautiful items, I got my angel tree topper from there several years ago and can’t wait to get her out every year. You have a super eye for thrifting. Every piece here looks terrific! I have a beautiful framed, under glass painting on my staircase I picked up for $40. Anything I found similar was over $200. Lots of great deals to be found. I love your cute ideas – especially the use of books! Nothing is better than finding a deal and creating something amazing as you did! Love it. What a beautiful throw! And just big enough for me and my husband to cuddle under! i love that console! mine is thrifted as well. Beautiful decorations and fun colors. You did an amazing job. Very talented! OMG Im so inspired! We just moved across the country and have no decorations and limited funds…I cant believe I didn’t think of this! I wonder what cute decorations I can find and clean up, how fun! Christmas is my boyfriends favorite holiday, I want to make it special. Inspiring me to get my holiday decor out for us to enjoy the full season. I love how the fireplace is decorated. Lots of beautiful decorations. Love the old fashioned pillows! 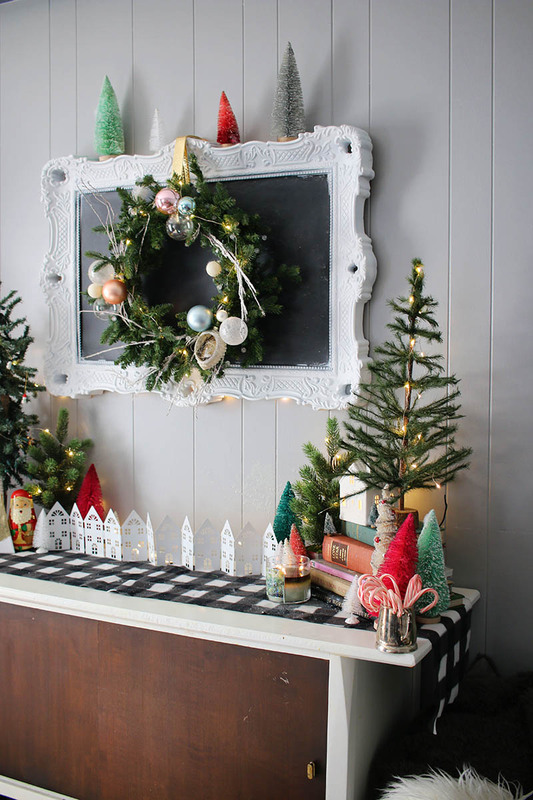 I love thrift stores, so I appreciate this post detailing how to decorate for the holiday using thrifted goods. I like the garland and the pillows. I love all of the fun colors and different Christmas items you used! So pretty! Absolutely love the fireplace decorations! Wow what a lot of great finds and everything looks so beautiful. I really miss being able to go to the thrift stores and garage sales. I just can’t get around very good. Ooooh, I have to have that amazing throw! Thrifting is so much fun! Love your mirror placed sideways, so pretty! I LOVE your decorating ideas! I’ve been looking for new ways to decorate my mantel! You did such an amazing job on that room! I wish I had your talent! Wow! That is amazing.. I love the white houses. 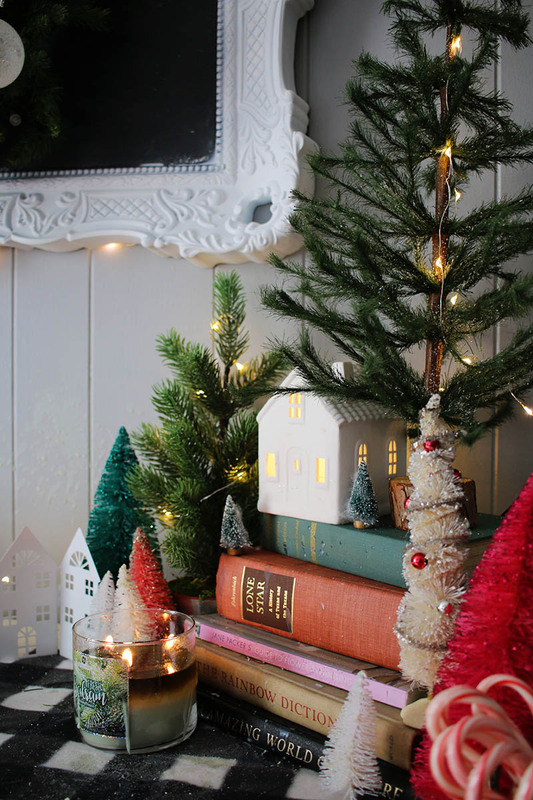 This is such a great way to decorate. Everything is so festive! So much of my holiday decor was found while thrifting. I like the stuff from my childhood – 1950’s and 60’s. Love the fireplace! The garland looks amazing! I also love thrifting you never know what your gonna find! Absolutely beautiful. And I love the idea of using books to add height and character. I love thrift shops, so much stuff for so cheap! Such beautiful decorations. I need to get in the Christmas spirit and start decorating. I love all of the Christmas decorations. I still haven’t put my Christmas stuff up yet. 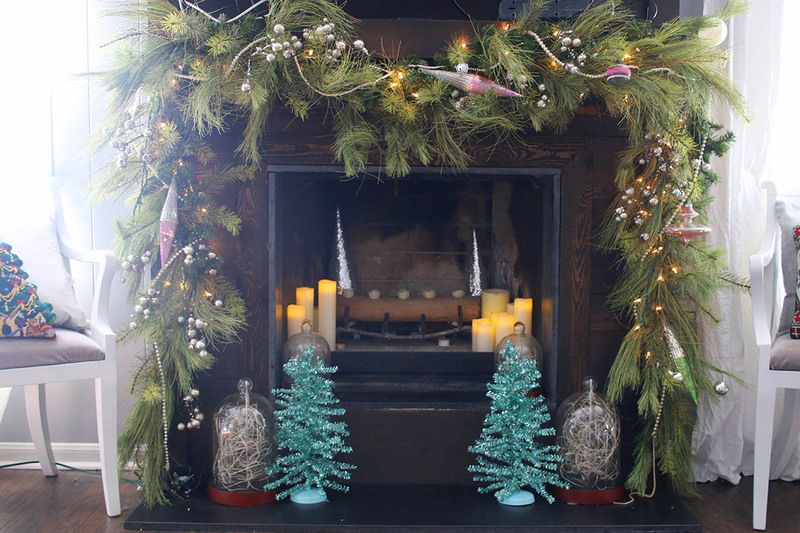 The fireplace wreath is so stunning. Your decorations are absolutely beautiful. 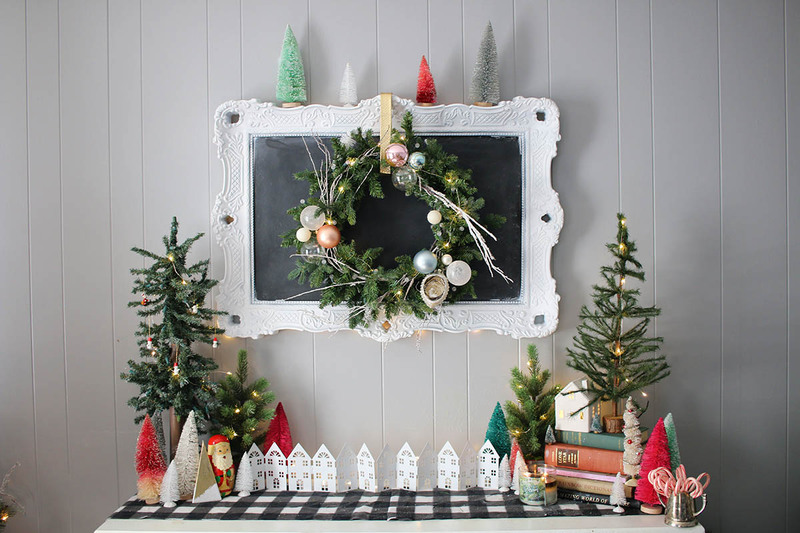 I simply love these decorations, especially the wreath!